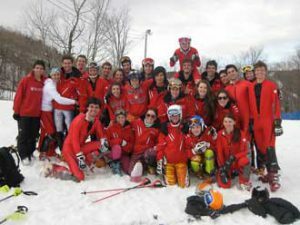 This past weekend at the Stoneham resort, the McGill ski team broke a 19-year-drought by winning its first overall Quebec University Alpine Ski Championship since 1991. Led by a record-breaking performance from Sophie Splawinski, the ski team edged out perennial powerhouse Université Laval au Québec for the title combining men’s and women’s results. Splawinski, a freshman in Atmospheric Sciences, capped off her historic season by winning a silver medal in the slalom event. It marked the 10th consecutive time the Montreal native climbed atop the podium this season – a feat never before accomplished on the circuit. Over the course of the season, Splawinski swept the giant slalom event, winning all five events. In five slalom races, she took three silver and two bronze. Despite her individual success, the former member of the Canadian national ski team was more thrilled about the team coming back to McGill with the championship banner. Splawinski is quick to point out that, because of its status as a club and not a varsity sport, the team is mostly self-funded, with many expenses coming directly out of the pockets of the skiers themselves. “A little support would make a huge difference,” she said. Following the completion of her CEGEP studies, Splawinski came to McGill in 2009 and immediately signed on with the ski team. She soon found that this was a team unlike any other she had been on. “One of the biggest differences I saw was the whole sense of team,” she said. “This is an individual sport and I grew up surrounded with that mentality where it’s every skier for themselves – even ones on the same team.